The war in the Seven Kingdoms has burned itself out, but in its bitter aftermath new conflicts spark to life. 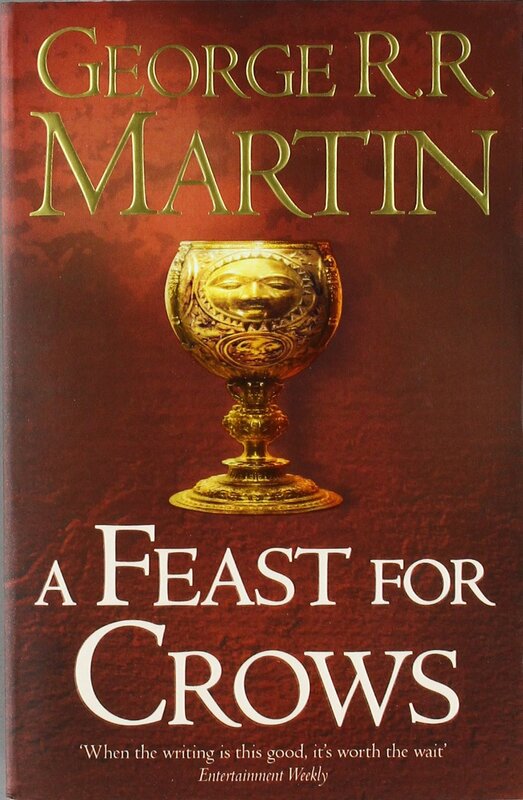 The Martells of Dorne and the Starks of Winterfell see vengeance for their dead. Euron Crow's Eye, as black a pirate as ever raised a sail, returns from the smoking ruins of Valyria to claim the Iron Isles. ​I found it difficult to motivate myself with this one, and there are a number of reasons for this. The first, and quite possibly the main, is that I have been ploughing through these since the beginning of the year, spending every spare second in Westeros. Something was going to have to give; I had read 2,500 pages of Martin, and I was beginning to weary. Secondly, I had increasingly mixed feelings about the ad hoc chapters from new viewpoints. Subtly named in ways such as The Soiled Knight, or The Princess in the Castle, these perspectives only occurred once per character. Although they contributed to a more rounded understanding of goings on, I would have much preferred them to recur, and I found it tiresome having to spend the first few paragraphs to understand which character was narrating. Thirdly, and least importantly, was the noticeable lack of some of our more prominent characters, namely Tyrion, Dany, and Jon. The focus here was on King’s Landing and its surrounding areas; the Wall and Mereen were omitted entirely, creating a constant curiosity for these characters and their situations. I couldn’t say this was all bad, however – I yearned for news which didn’t come, but the suspense that Martin creates with his complete lack of commentary on these characters is tense and anticipating. This is an important volume, though, despite my three complaints. Martin is building again, and wonderfully so. His character building of Cersei was second to none; I love her as much as I loathe her, and truly believe he has created something complex and brilliant with her. She’s a true villain, and whilst Martin doesn’t readily explain the reasons for this, we are helped to understand her motivations, her scheming, and ultimately see her box herself into a trap of her own making. Martin is also clear in his commentary on her position as a female leader; she’s unable to command respect entirely, with many believing her inadequate due to her gender. She consistently compares herself to her father, a similarly cold character, and that prompts us to compare her to her twin brother, who has surprisingly redeeming qualities. It’s all a character study, with these two being the most interesting, and I relished it completely. The depictions of battle-ravaged Westeros are wonders to behold. There’s a serious lack of fighting in this novel, yet we’re shown the spoils. Abandoned, burnt-out villages, decaying bodies hung from trees, orphans running inns, and kingless outlaws terrorising the roads, all were unsettling consequences of men playing the game of thrones. It's a dismal setting, and leads us to wonder whether the Seven Kingdoms will ever return to peace. As a latecomer to the wonder of Game of Thrones, I’m nothing but grateful to name myself such. Reading these together is an absolute joy to me still, and I can’t imagine how I would fare waiting years between instalments. With that in mind, as I move onto the penultimate addition to this world, I’m trying to remove from my mind the idea I’ve adopted that everything will be resolved in the seventh novel. That will be the moment when I join the legions of others in the waiting game for our next taste of Westeros. It will kill me, I’m sure.